UPDATED: San Diego’s contribution to Hurricane Matthew relief efforts grew Tuesday when the local American Red Cross affiliate deployed an additional 10 volunteers, bringing the total to 27. Five area firefighters and a civilian structural engineer who are part of an urban search-and-rescue team are already in the stricken southeastern United States. Authorities blamed more than two dozen deaths on the powerful storm, including 14 in North Carolina, where floodwaters continue to rise. Fatalities and damage were also reported in South Carolina, Florida and Georgia, and power outages were reported in Virginia. According to the Red Cross, nearly 4,800 spent Monday night in one of 90 shelters. Before Matthew struck the U.S., it caused heavy damage and killed more than 1,000 people in Haiti. “Our hearts go out to everyone affected by this devastating storm both in the U.S. and throughout the Caribbean,” said Bill Earley, CEO of the San Diego Red Cross chapter. “Even San Diegans who can’t go there to help, can help ease the suffering of our brothers and sisters in the Southeast by giving blood, signing up to volunteer here and by donating,” he said. The Red Cross volunteers from San Diego and elsewhere are providing safe shelter, food and relief supplies to storm victims. 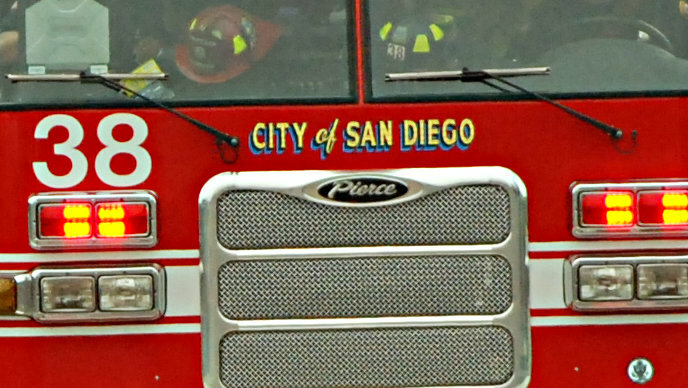 Two of the San Diego volunteers left Sunday in an emergency response vehicle and expect to arrive Friday, when they’ll begin distributing food and beverages. It’s the first time the vehicle has been deployed to the East Coast since Superstorm Sandy four years ago. More than 150 Red Cross vehicles from around the U.S. have been deployed into the region, along with 3,000 disaster workers and 100 trailers carrying food, water and supplies. The local firefighters left Friday so they could assist with logistical support, planning and communications, said Lee Swanson of the San Diego Fire- Rescue Department. The contingent includes Firefighter Mark Alvarez, Battalion Chief Mike Finnerty and captains Karl Becker and Robert Rezende from the SDFRD, along with Chula Vista fire Battalion Chief Jeff Peter and civilian structural engineer Vince Sobash. They’re members of the urban search and rescue team, California Task Force 8. Peter was leading a group of search-and-rescue members in North Carolina, and the others were working on various assignments in Georgia, according to Swanson. It was unclear how long they would be deployed. ORIGINAL POST 10/11/2016 10:28 a.m.: Five local firefighters and a structural engineer were sent to the southeastern U.S. to assist in search and rescue efforts amid the damage caused by what is now Post-Tropical Cyclone Matthew, authorities said Tuesday. San Diego Fire-Rescue Department Firefighter Mark Alvarez, Battalion Chief Mike Finnerty, and captains Karl Becker and Robert Rezende, Chula Vista Fire Department Battalion Chief Jeff Peter and civilian structural engineer Vince Sobash are members of the urban search and rescue team, California Task Force 8. They left Friday to assist with logistical support, planning and communications, SDFRD spokesman Lee Swanson said. Peter was leading a group of Urban Search and Rescue members in North Carolina, and the others were working on various assignments in Georgia, according to Swanson. It was unclear how long they would be deployed. The local search and rescue team is one of 10 working in storm-ravaged areas in Georgia, North Carolina and South Carolina.